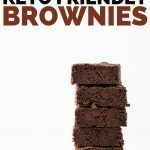 The perfect nut-free, chocolate, chocolate chip keto brownies recipe, made with coconut flour and cocoa powder! 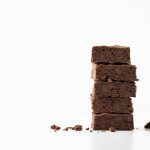 These brownies are quick and easy, and you probably already have everything you need in your low carb pantry. 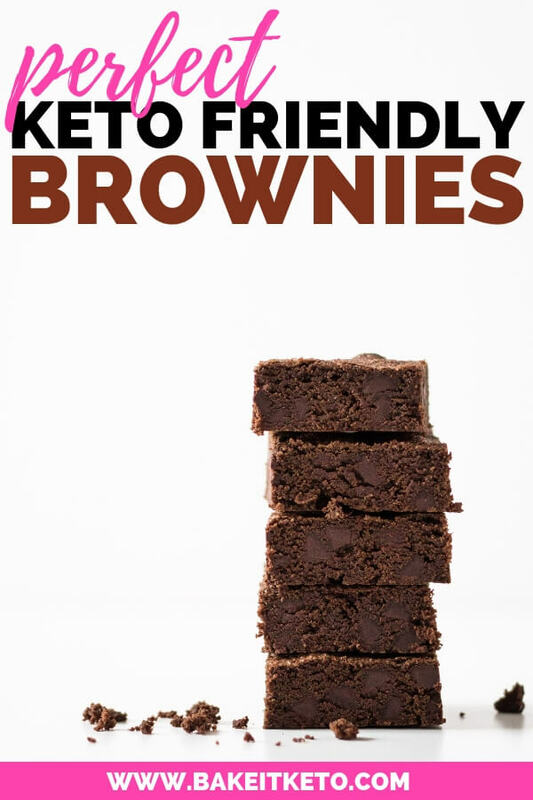 Brownies (especially keto brownies) are usually just OK. Passable. Why is that? As a young, super green pastry cook, I learned two very important things about chocolate. The first was that chocolate should always be salted (or rather, everything should be salted, and liberally). A pastry recipe without salt is a crime. Seriously. This recipe calls for 1/4-1/2 tsp salt. If you’re a salt-loving foodie (which also makes us kindred spirits), you’ll want the higher amount. The second thing I learned was that chocolate really, truly sings when it’s supported by other, subtle flavors. Flavors that you may not even consciously detect! There are a few different ingredients that pastry chefs regularly turn to for this, and often they have spicy, earthly, or umami qualities. In this recipe, we’re using a small amount of cinnamon. Just enough to have an effect on the flavor of the chocolate, but not enough to be detectable by most people. Most commercially produced cinnamon is actually made from inexpensive Cassia bark, which many serious cooks will refer to as “fake cinnamon”. Ceylon, on the other hand, is usually given the title of “real cinnamon”. Really, they are both barks from the Cinnamomum genus of trees, so neither is fake. However, their flavors are definitely different. Cassia bark contains a much higher percentage of cinnamaldehyde, which is what gives cinnamon it’s spicy flavor. Ceylon, on the other hand, has a milder and more complex flavor. There’s no right or wrong answer here, but I like the flavor of Ceylon cinnamon better. Your metal bakeware will last a lot longer if you never cut anything in the pan. Knives do a real number on metal bakeware. Instead, cut a strip of parchment paper the width of the pan. Grease the pan with softened butter or coconut oil, and fit the parchment strip into the pan so that it lines the bottom and two sides, as shown below. 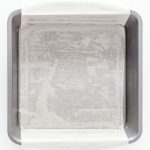 The fat used to grease the pan will help stick down the parchment and hold it in place (especially useful if your parchment came on a roll). 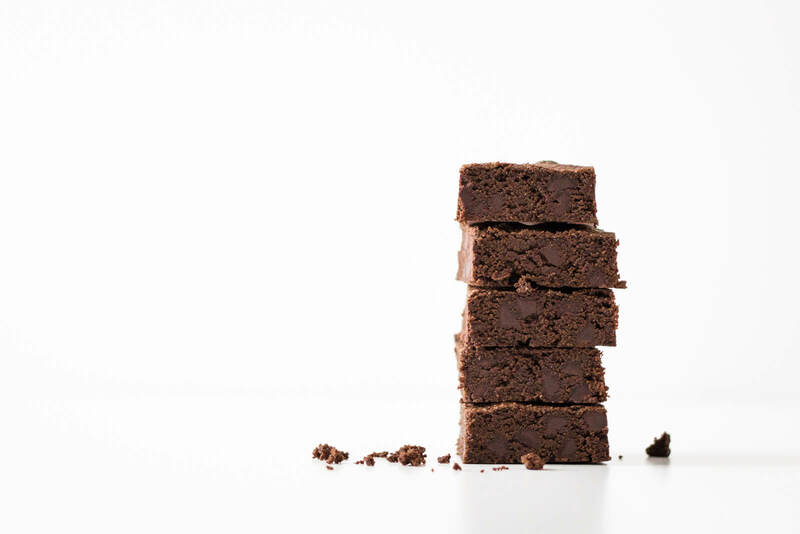 After the brownies have cooled slightly, hold onto the ends of the parchment and lift the brownies out of the pan and onto a cutting board, where they can easily be sliced. 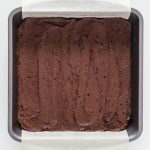 Wondering how to spread out the thick brownie batter (or frosting, or anything, for that matter)? Use an offset spatula! Not many home cooks have one, and they are an indispensable tool for pastry chefs. Once you get one, you will wonder what you ever did without it. To prepare your 8" square metal baking pan, first grease the pan with softened butter. Next, cut an 8" wide strip of parchment paper and lay it in the pan so it lines the bottom and two of the sides. Combine all of the dry ingredients in a large bowl, making sure to sift the cocoa powder as you add it. Add the eggs, melted butter, and vanilla to the bowl and whisk quickly to combine. The coconut flour will slowly absorb more moisture, eventually creating a very thick batter. You want to be done whisking before that happens! Using a rubber spatula, scrape down the sides of the bowl and fold in the chocolate chips. Bake at 300 degrees F for 15-17 minutes or just until done, turning the pan halfway through the baking time. 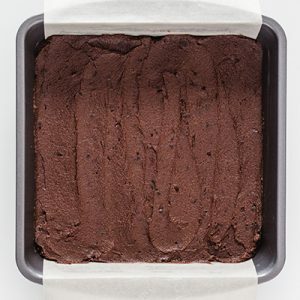 Allow the pan to cool and then use the parchment strip to lift the brownies out of the pan and onto a cutting board. Slice into 16 pieces. 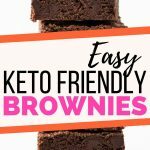 WANT TO SAVE THESE DOUBLE CHOCOLATE KETO BROWNIES FOR LATER? CLICK HERE TO PIN THEM TO YOUR FAVORITE KETO PINTEREST BOARD!